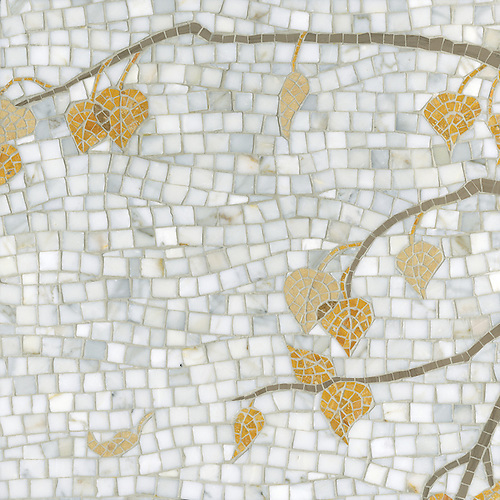 Judging by these headlines, obviously some of us at New Ravenna had a lot of fun at the expense of our new series of tree-inspired vignettes introduced at Coverings. A subset of our Silk Road collection, the vignettes are designed to be feature walls and inspired by various Asian aesthetics (from Chinoiserie to Japanese wood-cuts). We jokingly refer to it as the “Great Wall” series. 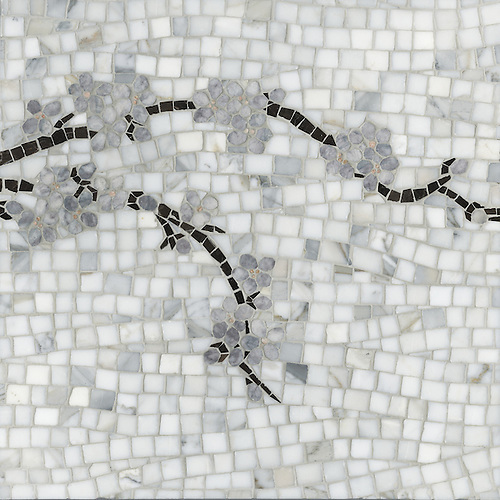 It all started in 2007 when we introduced glass mosaics and exhibited a panel we call “Bird and Branch”, pictured below. Never properly marketed, I believe its time may have come! Fast forward a couple more years, and James Duncan designed “Ikebana” which, if you do me the honor of reading this blog, you’ve seen in my own kitchen. Based upon pine branches, it integrates my kitchen into the landscape in which my house sits. It also reminds me of the time I tried to run away as a child and only got as far as my favorite pine tree. I climbed it, talked to it, and moped around in it (for an hour) before wisely re-evaluating my plans. I’ve always had a thing for the woods. When I was a kid, I practically lived in the forts my sister and I built in the forest surrounding our home. We’d take our cassette tape player out into the woods and I’d like to say we played Chopin, but actually we listened to the “Saturday Night Fever” tape that my mom brought back from her forays “across the bay” to civilization in Norfolk, Virginia.We’d dance to the Bee Gees, dig holes in the dirt next to a ditch we thought was a stream, line the holes with velvety green transplanted moss, and play house in the fort we made from the old (but still living) holly tree that had fallen over our “river”. And we had rules: we were not allowed to use anything man-altered to fabricate our forts.No two by fours. No nails, tarps, etc.Only branches, twigs and pine-shatters. Obsessed with trees since birth, my most vivid childhood memories all involve trees. There was the big weeping willow in the front yard of my grandmother’s house. Horse crazed but pony-less, my sister and I would use the long branches as tails and gallop around. Then there was the orchard my father insisted on keeping–pears, peaches, persimmons, apples–even an almond tree. berries. We were eating insect and weather-marred fruit from our trees long before it was cool to buy imperfect organic fruit. We didn’t feel cool though. We felt itchy. In one of my posts I’ve already mentioned the time we attempted to tap the local maple trees to make syrup. Even though our final product tasted more like maple bark than syrup, tramping around the woods each day, collecting the sap, was a profound experience–and a commune with specific trees. We even heated the house with a wood stove.Year after year, my father, siblings and I would dedicate most weekends to what I now think of as the “forced march”–locating dead trees, waiting for Dad to cut them up with the chainsaw, hauling the wood out of the forest, stacking it in the trailer, taking it back to the house, re-stacking it in the woodshed after chopping it up into appropriately sized hunks. I bet most of my New York friends have no idea that I’m pretty good with an axe. So I hope I haven’t bored you too much with tales from my childhood, but is it any wonder I am so attached to this collection? I know I’m not the only one who has fond tree memories. Perhaps we can help re-capture them for you or your clients by designing a custom wall with the branches of your choice. For example, we didn’t have any palm trees to play with on the Eastern Shore of Virginia., but I’m sure many of you did. It takes very little time and costs almost nothing to have us sketch up a bespoke concept for your own “Great Wall”. We’re very good at taking direction–we’ll edit to your heart’s content until the composition is exactly what you and/or your client envision. One of the fabulous designers who makes this happen is Cean Irminger. Lately she’s been entering a fabric design contest every week at an online fabric printing house called “Spoonflower”, and last week she WON (again). Check out her owl apron design here. Incredibly inventive in all manners, she’s also the one who came up with our “Bough Wow Wow” headline. 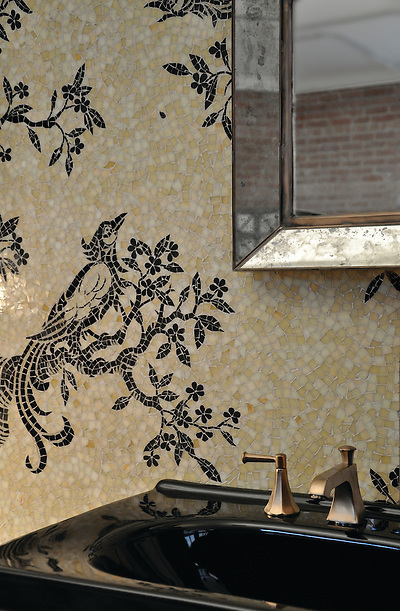 We are truly blessed to have Cean on our design team at New Ravenna. Thanks again for reading my ramblings–and may you have a super week! 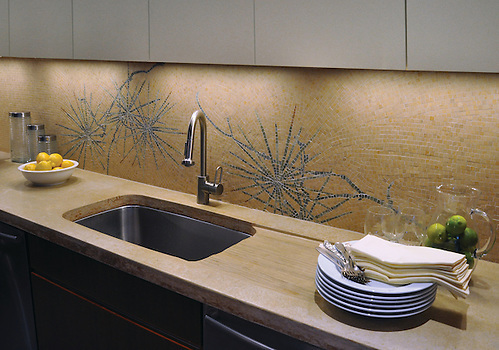 I particularly like the kitchen mosaic featured here but I also love your designs with the branches for the bath. 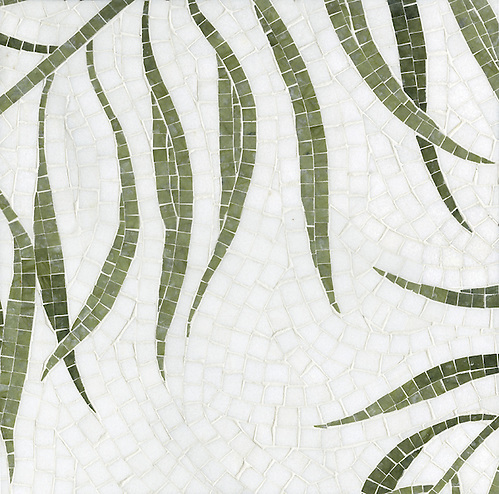 My favourite tree for the bath would be the palm tree.. SUCH delicacy and grace in these – both in design and execution. The foliage, yes – but also the air. Many thanks to you and MGD! George, I'm so happy you commented! Gave me an excuse to visit your blog and find out about your radio show. I love one of your tag-lines: "The show is for anyone who’s interested in learning how imagination is cultivated and fed and how it translates itself into tangible objects." That about sums it up, doesn't it? Count me in! What a lovely post. Your designs are so beautiful they take my breath away, and they do remind me of happy times playing in your forts. I must come and visit your showroom this summer! YES. Please. Come. See. Me. It's been way too long!